Too much earwax (clinically termed cerumen) can lead to ear pain, ringing, itching, or loss of hearing. Because the ear area is very delicate, people are often advised to seek treatment from a doctor. As a solution for cerumen control used by medical professionals, Nupur Technologies presents the patent pending Earigator featuring our own Model #130. 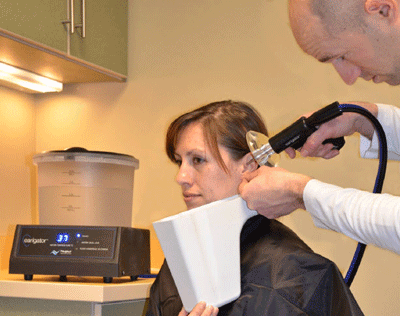 The Earigator combines the functions of an otoscope and irrigation device into one product. Designed by an Otologist, this application features a fully automated temperature and pressure control system. Smart Products Standard Cartridge Model #130 at 3/8" O.D. is used as a pressure relief valve. If the pressure is too high in the hand piece, the valve will open and allow the solution to recirculate. Water pressure control is a critical function of the Earigator, and the Model #130 is used as the first line of security within this system. 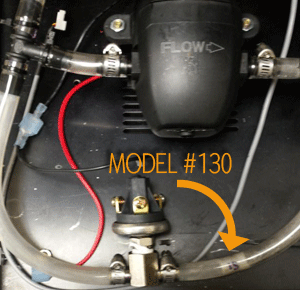 When the water pressure reaches a certain point, the Model #130 activates to divert water back to the reservoir. For ultimate safety, a pressure switch is used to shut off the Earigator system completely, if needed. 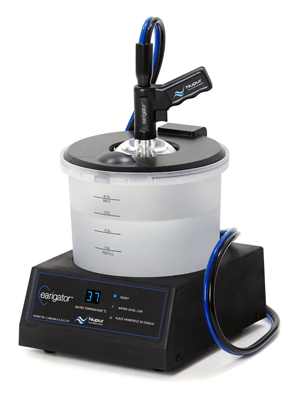 The Earigator's base unit houses the pressure, temperature, and flow controls, as well as the water reservoir, heater, pump, and a digital display. A connected hand piece includes a flow control trigger, water nozzle, magnifying glass, and LED lights. A procedure with the Earigator is designed to last about 3 to 5 minutes. For more information or to download the Earigator brochure, visit www.nupurtech.com. Compact, cost-effective, and available in customizable components, the Model #130 is a great option for applications requiring 3/8" O.D. sizes. This valve is also easily press fit, glued in place, or mounted inside soft tubing. Plastic body materials for the #130 include Polypropylene, Nylon, Acrylic, Acetal, PVDF, Polycarbonate, Ultem®, and ABS. O-ring availability includes Buna-N, EPDM, Viton®, and Silicone. Opening PSI ranges for this valve are 0.17 - 20 PSI.